"Notre Dame of Paris is Notre Dame of the whole of Europe, We are all with Paris today. ": EU Council President Donald Tusk. "We express our closeness with French Catholics and with the Parisian population. We pray for the firefighters and for all those who are trying their best to tackle this dramatic situation,": Vatican spokesman. 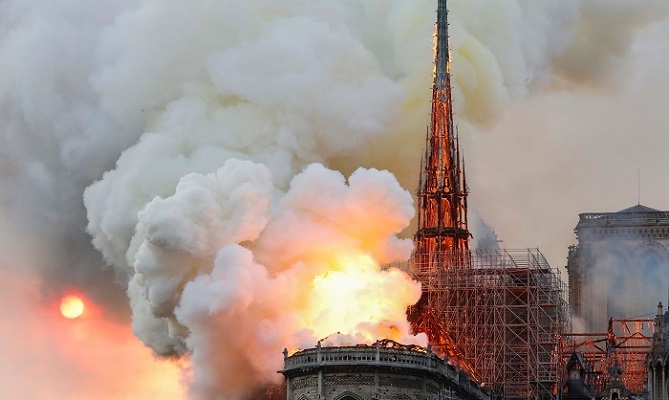 "So horrible to watch the massive fire at Notre Dame Cathedral in Paris. Perhaps flying water tankers could be used to put it out. Must act quickly! ": President Donald Trump. "My thoughts are with the people of France tonight and with the emergency services who are fighting the terrible blaze at Notre-Dame Cathedral. ": British Prime Minister Theresa May. "These horrible images of Notre-Dame on fire are painful. Notre-Dame is a symbol of France and of our European culture. Our thoughts are with our French friends. ": German Chancellor Angela Merkel's spokesman Steffen Seibert. "We are following with alarm the news arriving from Paris of the fire at Notre Dame, one of the most beautiful cathedrals in the world. Sad news for our history and our universal cultural heritage. ": Prime Minister Pedro Sanchez. "A blow to the heart for the French and for us all Europeans". : Prime Minister Giuseppe Conte. "Notre Dame de Paris on fire, a huge emotion, Victor Hugo, a part of the history of France, of Europe. My thoughts and support for our French friends. ": Prime Minister Charles Michel. "Shocking images from Paris. An emblem, a cultural heritage of humanity and one of the most beautiful works of art in French history. Notre Dame is in flames. We hope no one is injured. Our thoughts are with Paris,": Austrian Chancellor Sebastian Kurz. "Tonight we pray for the firefighters tackling the tragic Notre Dame fire - and for everyone in France and beyond who watches and weeps for this beautiful, sacred place where millions have met with Jesus Christ. ": Archbishop of Canterbury Justin Welby.